The Scoop: With so many video games in existence that cater to different types of target market, it is not so uncommon to see crossovers every now and then. However, there are crossovers that left gamers surprised with a few to shake their heads in wonder and exasperation. Check these surprising crossovers in the history of video games. In business, doing video game crossovers is another way to rekindle the love and passion of fans with the game. It is also exciting to see different characters from different games to interact with each other. You’ve seen Wreck-It-Ralph, right? However, to make the most of their resources, game publishers are mixing up odd game character crossovers. This result to make players feel awkward and weird, yet some are pleased with the mix that those games became an instant hit. Here are some of the surprising crossovers in the history of video games that will leave you happy, weirded out or just plain confused. 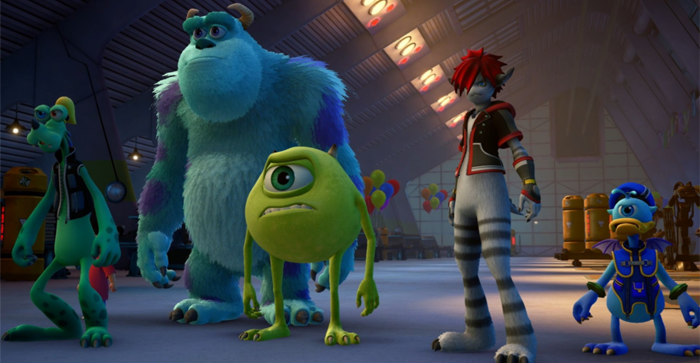 Kingdom Hearts is one of the surprising crossover games on our list. Not only that, it is also popular with the upcoming release of yet another sequel this year: Kingdom Hearts 3. Other than having Goofy and Donald on his side, Sora will traverse to the different worlds of Disney such as Toy Story, Monsters Inc., Tangled, Jungle Book, Big Hero 6 and probably more on the way! Now you get to see your favorite Disney peeps together in a game, good and bad alike. This is probably one of those crossover games that is not only downright weird but also a disaster to Sega due to copyrights, bugs and one of the characters offended the players that are playing. Even though this game was a desperate move to save a failing company, it has graced our list for being the weirdest crossover video games ever made that surprised the people with its weirdness. Currently, Mega Man is one of the most anticipated game this year! However, it has its share a myriad of flops and successes in the past as well as a few in between. Street Fighter X Mega Man is one of those shares that is stuck “in between.” Even the developers admitted that it was a weird crossover, that still didn’t stop the people from loving the game. This is another game that was so successful that they had to make a sequel. Poker Night 2 is the sequel of Poker Night in the Inventory. Even though this kind of game isn’t the usual titles that Telltale Games are making, this has been more than welcomed by players. Now you just get to play cards and chill out with your favorite game characters without the hustle and bustle that they are always in when in-game. Can you imagine Pokémon crossing over other games? Well, imagine no more, because Pokémon Conquest answers that question. Despite the initial weirdness and getting used to with the change of characters with Pokémon, Pokémon Conquest was a surprising success, charming the players with the balance of Pokémon and Nobunaga’s Ambition. If you think about it crossovers are some of the things(other than Wreck-It-Ralph) that made us realize that under all those programmed codes, how will the game characters react when they meet other characters? No matter how weird they may get, you still can’t help being excited how each character will react to the other. So what’s your favorite crossover game? Love games and technology? Read up for more of those nuggets of wisdom!